(CNN) -- Paul Casey carded a five-under-par second round 67 to lead the field by two strokes at the halfway stage of the BMW PGA Championship at Wentworth. Paul Casey had two eagles in his five-under-par round to lead the PGA Championship by two shots. Casey, 31, had two eagles and four birdies to move from two off the pace, to two in front, as a host of big names failed to make the cut on Friday. "I would have taken a two-shot lead at the start of the day, but there were still a few too many mistakes, which was a bit frustrating," Casey told reporters afterwards. Among those to have the weekend off are Masters champion Angel Cabrera, who crashed out on five-over-par after a 75, while Players Championship winner Henrik Stenson and South African Retief Goosen only managed one better than that and are also going home. Last year's runner-up Oliver Wilson carded a seven-over-par aggregate while Lee Westwood had a second-successive 77 for 10 over-par -- his worst 36-hole score in Europe for six years -- to also miss out. A group of five players share second place on 138 (-6), including defending champion Miguel Angel Jimenez and joint overnight leaders David Horsey and Anthony Wall. Jimenez is aiming to become only the third player, after Nick Faldo and Colin Montgomerie, to make a successful defense of the trophy. "I think this course suits me because you need to control the ball," said the 45-year-old. "It's always a benefit being a long hitter, but it does not make much difference here because you have to place the ball." 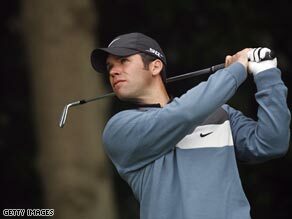 Former British Open champion Ben Curtis and South African Thomas Aiken are in joint seventh position on five-under-par.